It has been a long time since I’ve traveled to a place that really transformed me the way that Cuba has. Being forced to mostly disconnect was the greatest blessing in disguise. I didn’t have to think about posting on social media or who to tag. I didn’t need to check my email in case anything important came in or even just to keep up with my inbox. I didn’t passively scroll through Facebook or Instagram just because I had some down time. Instead, I really got to know the other inspiring women on the trip with me, and explore a place forgotten by many. I was forced to talk to people to ask for directions or call a taxi, and on top of that, practice my Spanish. If you’re considering a trip to Cuba, don’t hesitate. Here are some tips to get you started on what to know before visiting Havana, Cuba. To start, check with your airline to see if you can purchase your visa from them. 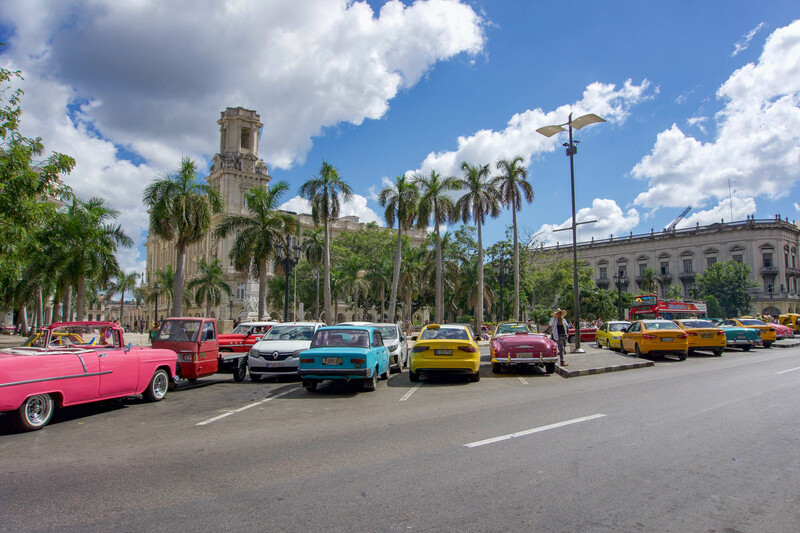 If so, you can typically do so right at the departure gate (note that if you have a connecting flight, it will be at the gate of the flight going directly to Cuba, the last leg of your trip). Regardless, you’ll have to get your passport and documents checked at this gate. If your layover is short, you may want to order your visa before your trip for peace of mind. I only had an hour layover in Atlanta so I purchased mine ahead of time from CubaTravelServices.com to be safe. There is a shipping surcharge to do so, but it is well worth it to have one less thing to worry about when catching your connecting flight. For those flying direct, this is less of an issue because you can control getting to the airport early enough to make sure you have enough time to secure your visa. Don’t throw away your visa or any other documents that were given to you upon arrival. You will need them when you depart. It’s also required for visitors to have Cuba-specific medical insurance, which many airlines include in the airfare cost. If that’s the case for your airline (it was for me flying Delta), make sure you hold onto your boarding pass for the duration of your trip as it will serve as evidence of the insurance policy should any emergency medical services be required during the trip. You should also keep a copy of your trip itinerary handy, and it never hurts to have a copy of important documents saved on your phone as a backup. If you’re taking a taxi from the airport, they are readily available at a fixed price of 25 CUC per car (not per person). If you have a ride pre-arranged and you can’t find your driver, take a look outside as well. They don’t all stand inside while they’re waiting. Airbnb is the best option for finding accommodations around Cuba. For many locals, renting out their homes is how they make their living. These are called casa particulars. Sign up for Airbnb with this link and receive $40 off your first stay. At most of these casa particulars, you can pay an extra 5 CUC ($5) for them to cook breakfast for you. I stayed in Vedado, one of the neighborhoods in Havana, which is also where I recommend staying. You get more of a local experience here compared to Old Havana, which is filled with tourists. It’s definitely worth visiting Old Havana, just don’t spend all your time there. As of November 2017, the US government has restricted US citizens from staying at most hotels. View the full list here, especially if you are traveling on your own. First things first, download maps.me before you leave for your trip. This will be a valuable tool for navigating once you are in Cuba because the map works incredibly well offline. You can even pin important destinations on the map ahead of time. While you’re in Cuba, there are two different types of taxis. Many of these are the old American cars, though they may also be old Soviet cars or even newer cars from China. Collectivos are shared local taxis for a fixed price. Think Uber Pool or Lyft shared rides, so don’t be surprised if a Cuban jumps in along the route. They may not drop you off right in front of your stop, but they are a cheaper option. Tourist taxis are private rides so they’ll be more expensive, but be sure to negotiate the price. They’ll typically try to charge you a higher rate because they know tourists will pay more. There’s always a bicitaxi if all else fails! The best plan for WiFi in Cuba? Plan on not having it. It’s never guaranteed, but if you do need to connect here’s how you would do it. There are WiFi hot spots in the public plazas, but not for free. You can’t miss them because there are always people sitting around looking at their phones. You can buy a one-hour internet card for about $1. You’ll have to input a code to sign on and it will tell you how much time you have remaining, though you don’t need to use it all at once. I actually found the connection speed to be much better than I expected, but to be safe, don’t count on it always working properly because you just never know. In short, yes. For women traveling through Cuba, especially by yourself, you can definitely expect to receive attention in the form of catcalling. But ultimately I always felt safe, especially knowing I can always ask a Cuban for help. Cubans spend a lot of time outside with their families just hanging out, so you’re never really alone wherever you go. In fact, Cuba was recently awarded the safest country for tourism at the 38th International Tourism Fair in Madrid. One common dish you’ll find is arroz con pollo, which is simply chicken and rice. You’ll also see ropa vieja frequently, and no it’s not actually old clothes! Ropa vieja is a shredded beef that is typically served with rice and friend plantains. I also had some delicious fried chicken at Las Cotorras, a restaurant in Regla, a municipality of Havana. Don’t drink the water out of the tap in Cuba. Buy water bottles or, to save on plastic, bring along a filtered water bottle like the GRAYL water purifier bottle. Also be sure to pack snacks in case you get hungry during the day as there is not always something quick and readily available to pick up between meals. Have patience. You’ll be lucky if most things go according to plan. Be ready to go with the Cuban flow and keep an open mind. While you can travel on your own, it’s much more complicated to do so as a United States citizen, especially under the current administration. I went with a group and absolutely loved it. There are places we went that I never would have found traveling on my own. For things you can do on your own, don’t miss exploring the city on two wheels on a bike tour with Vélo Cuba. Then browse some art and do some dancing at Fábrica de Arte Cubano. You can also enjoy a city tour by vintage car with Nostalgicar, owned by a husband and wife team that refurbishes old cars. Next, stop by Cuba Libro for coffee and books. It’s the only English language bookstore in Cuba. They also offer free English classes where they pair up locals with students from the United States who are studying at the University of Havana. While visiting Cuba Libro, our group had the chance to chat with the owner, Conner Gorrey, who does a lot to support the local community. She is the author of 100 Places in Cuba Every Woman Should Go. We did have the chance to get outside of the city one day when we visited Finca Marta, an organic farm about 20 miles outside of Havana. The owner, Fernando Funes, shared how the farm got started and their sustainable practices while we toured the grounds. He received his PhD in Holland and has been involved with research and education for about 20 years. It all began with a well. It took seven months to dig, since it was a very rocky area. They used those rocks all around the farm and built the barn, house, and horticulture area with them. The well is still in use today and is now a symbol of the farm. They grow 60 different kinds of vegetables and herbs — kale, arugula, celery, spinach, and much more. There are 100 beds that they rotate continuously, and they are always making improvements. They don’t use any chemicals and they use the compost for fertilization. While it’s not very common that women are hired by private farmers in the countryside, half of the people working for this project are women, and they also hire the elderly and those with disabilities. Our visit concluded with a delicious farm fresh lunch. Fernando said, “In a very tough environment, you can make what you want if you work hard enough,” and looking around the farm, he definitely proved that to be true! In the end, Cuba reminded me of the importance of human connection and what it really means to get to know a place. It forced me to take better notes, to slow down and listen more, and even to take more time to read during down time rather than checking my phone. I’ve never immersed myself in a destination in such a short period of time the way I did in Cuba. Forget everything you’ve seen in the media and anything you think you know about Cuba. Start from scratch. Ignite your curiosity and take the time to get to know Cuba for yourself. Cubans are open and ready for your business. Now is an incredibly important time to be breaking barriers down instead of building them up. The people of Cuba are ready for you! Big thanks to CubaConnect for leading this trip and for Wanderful for bringing this amazing group of women together!